Elizabeth Cole is dead, she just doesn’t know it yet. How would you react if faced with an exact living breathing sentient replica of a significant, if not beloved person from your past… who also happens to be dead? Would you embrace them or renounce their existence, denying them and allowing them to be treated as second class citizens as per the Ghost Protocol? These are the questions asked in Sharon Lynn Fisher’s dynamic debut novel Ghost Planet. Ardagh 1 is in the process of being colonized, and psychologist Elizabeth Cole has accepted a position as a therapist to aid the colonists adaptation to living there. The same issue that has haunted many colonists over the centuries is happening on Ardagh 1, how to supress the indigenous population only in the case of this novel for each colonist that arrives a strange phenomena takes place an alien “ghost” is manifested who has a symbiotic bond with the host colonist. These ghosts do not know that they are not dead, they do not know that they are not in fact the person of whom they are a perfect clone of. Psychologist Elizabeth Cole prepared for the worst when she accepted a job on a newly discovered world—a world where every colonist is tethered to an alien who manifests in the form of a dead loved one. But she never expected she’d struggle with the requirement to shun these “ghosts.” She never expected to be so attracted to the charming Irishman assigned as her supervisor. And she certainly never expected to discover she died in a transport crash en route to the planet. As a ghost, Elizabeth is symbiotically linked to her supervisor, Murphy—creator of the Ghost Protocol, which forbids him to acknowledge or interact with her. Confused and alone—oppressed by her ghost status and tormented by forbidden love—Elizabeth works to unlock the secrets of her own existence. I think it is harder to write a review of a book you truly love because you cannot help but feel that anything you add would be inadequate, which is how I feel about this wonderful sci-fi/romance by Sharon Lynn Fisher. This novel combines all the best things about science fiction and romance novels in general. The world building is exquisite, the plot twists are frequent and unexpected the characters of Elizabeth and Murphy are fascinating and believable. I couldn’t read this novel fast enough and I definitely will be adding it to my “insurance against the apocalypse” collection. I found it ironic that Linnea Sinclair another one of my all time favorite sci-fi writers endorsed this book because if I were to compare Ghost Planet to any other work it would be to the best of Ms. Sinclair’s. 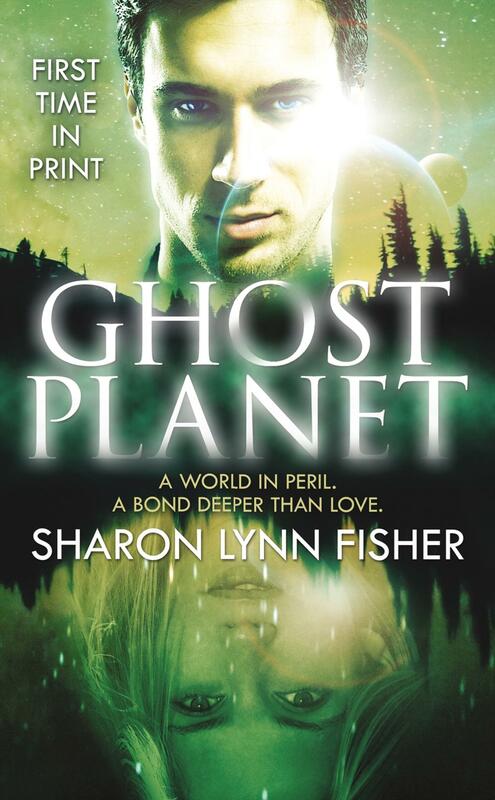 If you are a fan of science fiction or even just a good old fashioned action packed romance then Ghost Planet is for you. It is with bated breath that I anticipate Ms. Fisher’s next novel The Ophelia Prophecy due out in February of next year, it is going to be a long six months. I am sure it is no secret based on the review that I adored Ghost Planet and would LOVE to review an ARC of The Ophelia Prophecy. Waiting, unfortunately can be an issue for me and I am worried about the disasters that might befall me if left to my own devices until February!